Ok, so I am now in searching for a vet mode.....I did look at the vet options listed here for my area. All Pets Clinic seemed to be the only vet located near me, well I have to say I am less than impressed with them. I have been to their office with my Uncles dog when she got hurt and he was in the hospital, and I was less than impressed then, but I wanted to give them the benefit of a doubt because it was an emergancy type thing in the later afternoon ect. Well I have made 3 calls to them now regarding sugar gliders, 1st call was when I was looking at getting a male and female joey and I wanted to find out about neutering, the lady I spoke to was so short and rude with me I was not impressed. Well now today I call them to inquire about wellness checks for my girls when I get them and when they answered the lady cut me off mid sentence and puts me on hold, then picks up and hangs up on me..........so I call back now the 3rd time and get a different lady and I ask about wellness checks and fecals, well she tells me it will be $65 a piece for the well checks and $20 each for the fecals and hangs up....this has left a "bad taste in my mouth" for this vet! You know what if I had other questions, I just feel if I take my girls there I will have less than par service. Now onto my other discovery....I put some calls into the 2 vets I use for my dogs and they have both referred me to Dr. Tina Merit @ Lady Lake Animal Clinic, according to the lady I spoke to at the office she has been seeing sugar gliders for 10+ years, but I am surprised she is not listed as a sugar glider vet anywhere that I can find. I have chosen to use her to see my girls when I get them. I will defiantly give my feed back of her after our visit, it will be a month or so as I do not even have my girls home yet. Another question I have is should I take my girls straight to the vet and have them checked after I pick them up or should I bring them home for a few days first? Anything else I should be aware of?? I do not know what part of Central FL you are in exactly, but I am sure Tish could recommend vets in the Orlando area... Natasha could for near Bushnell, and over here my way I use a vet in Elkton. The breeder I am getting them from told me the parents had recent fecals done and were clear of any parasites, I don't know that she will be taking them in for well checks before I get them. I am near Ocala, Orlando is about an hour and 15 mins from me, Bushnell is closer and my husband works out of Wildwood which is close to Bushnell, so if someone can refer someone in Bushnell that would be great. 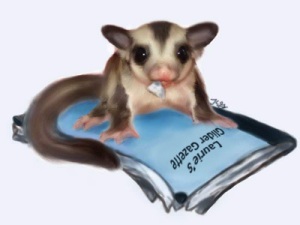 As of now I am going to try Lady Lake Animal Clinic, hopefully this vet is knowledgeable about sugar gliders and I don't feel I know more than her when I go lol.